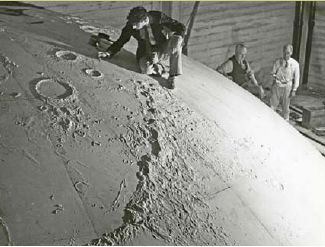 Artist working on the moon sculpture for the Griffith Park Observatory in Los Angeles. Photograph by R. M. Starrett. From the John C. Austin Papers (Collection Number 904). Courtesy of the Department of Special Collections, Charles E. Young Research Library, UCLA.